I love showing my readers how to decorate their homes without breaking the bank. 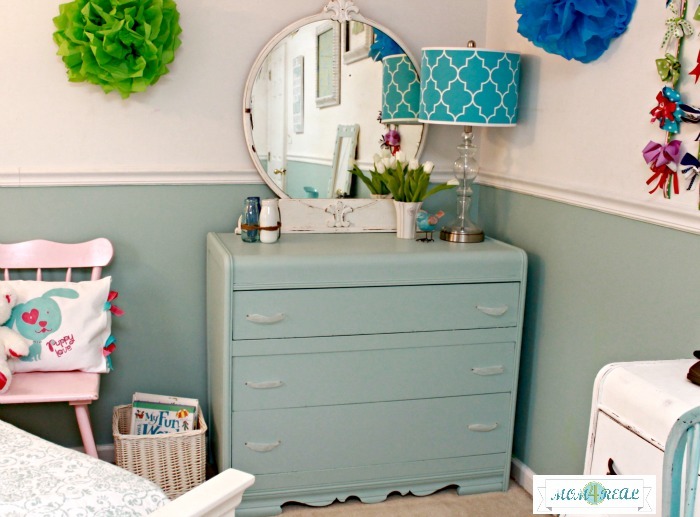 Today, I am going to show you how I turned an abandoned dresser that I found on the side of the road into a beautiful painted dresser for my daughter’s new big girl bedroom! Wanna see what it looked like before I got my hands on it? There I was, driving to Target when I spotted this beauty and a matching vanity. I pulled my car over so fast, I’m pretty sure I almost gave my daughter whiplash. I couldn’t just leave it there, though…I mean look at it! The mirror alone had my heart beating super fast! Not exactly what I would call pretty…well, maybe back in the day, but not in this state, but I just knew it could be. You should have seen me trying to wrestle all of these into my SUV…I’m 5 feet tall, so I’m sure it was quite the site! So, I got it home and let it hang out in my garage for a few weeks before I decided to paint it. It came at the perfect time, because Kate was dying for a big girl room. She wanted her room to match the rest of our home which is decorated in what I would refer to as a beach cottage style. I had just painted her room, when my husband hauled it up the stairs for me. 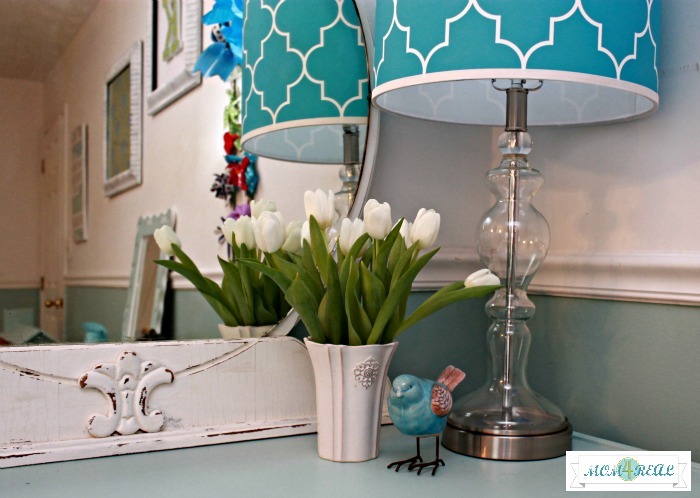 Kate and I decided to paint the mirror white and the dresser the same aqua color as we painted her wall. I used Valspar’s paint and primer in one in Lake Breeze in an eggshell finish. The only problem was, the cup handles were in terrible shape. Well, me being the thrifty girl that I am, decided to try and see if I could find something around our home that we could use. I raided my ribbon stash and ran back upstairs to give my idea a try…ribbon pulls! They worked perfectly! Aren’t they so simple and sweet? And…they work! Did I mention they were free??? We pulled together some things from around the house to dress her new dresser up, and added a new lamp. I have to admit, I tried to get Kate to take the pom pom flowers down, but she quickly reminded me that this was her room and not just for a blog. Whoops…need to remember that more often. So, the tissue paper flowers stayed, and Kate’s room is one step closer to being finished! So…what do you think? Would you give a roadside dresser a chance? « Green Giant’s Very Giant Surprise! Thats just too darn cute! I have a similar dresser and vanity (it was my grandmother’s)–I would’ve pulled over for something like that! Great find. Thank you…it sure was a mess, but we love it now! Great transformation. I love the color and ribbon pulls. I love that lamp! Where did you get it from? Oh, my goodness, I’d definitely give it a chance! I used ribbon on my washstand and I still have it there. I think it’s really sweet! This transformation is awesome, I love the color and the unique pulls! What a wonderful job you did! Simply amazing! The color and ribbons are delicious… It is really sweet! This is such a great find! I can’t believe it was free, just sitting there. Crazy!! It’s so pretty now. Love that the detail on the mirror base shines now with the white paint treatment!! Super feminine with your smart choice of new hardware too. The dresser turned out beautiful…great choice of color and ya gotta love kids…they put everything into perspective! !…The ribbon pulls are so pretty…you are so creative Jessica! I love it! You painted it the perfect color and I love the idea of the ribbon handles! Do I see the vanity painted in pink in the corner of one of the photos? Amazing job and the pom pom flowers are awesome! So pretty! I am loving the ribbon handles! I’m jealous I never find anything but road kill on the side of the road!! Gorgeous job and it’s my favorite color too. That lamp is pretty stunning too! You did a beautiful job! Just curious did you sand it at all before painting that color? Thank you! I didn’t sand it. I just painted the edges with a brush and rolled the rest on. It has built in primer, so it went on like a charm. That is UH-MA-ZING! You made it totally different and it’s beautiful! You rock, I adore it! That’s adorable! 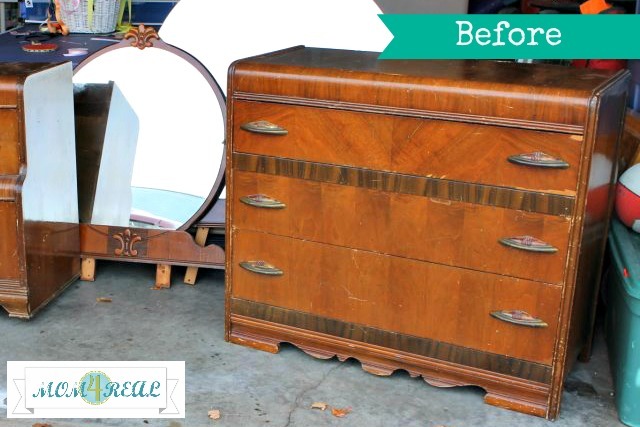 I love the color and the ribbon handles, what a great transformation! So pretty! And great idea about the ribbons….buying hardware is always the most expensive part of redoing furniture, it seems. I have a dresser almost just like that one! – well now that I think of it I have 2!! 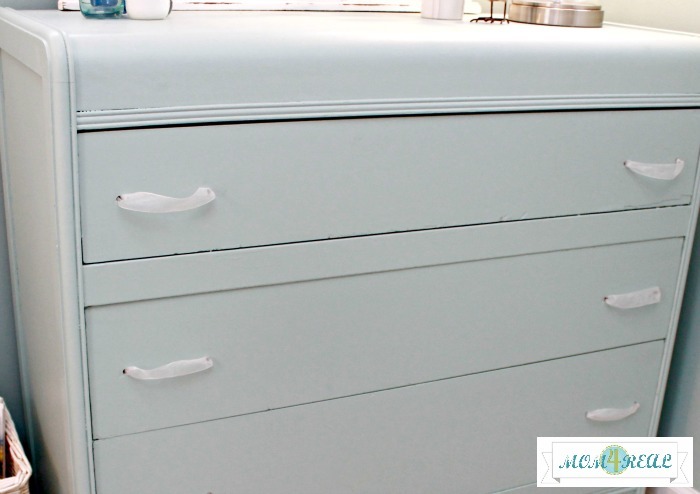 I was going to put one in the bottom of my closet to add drawers for storage and now I want to paint it – love the colors and the pulls. You did great! 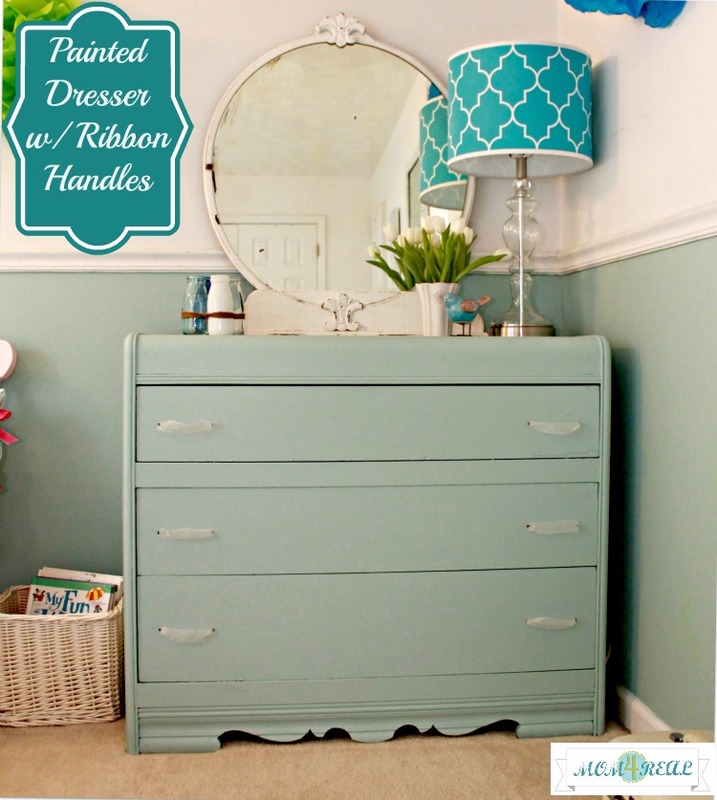 The dresser has great style and you made it better with that color and those sweet handles! What an amazing furniture update! Looks great! I’ve been dying to paint some furniture in my girls’ room for ages, but I’m always a little too afraid to take the plunge. :) Thanks for making it look easy! You know I am in love with this dresser! Thanks for linking up to Monday Funday with us! XOXO! Well, it’s perfect! 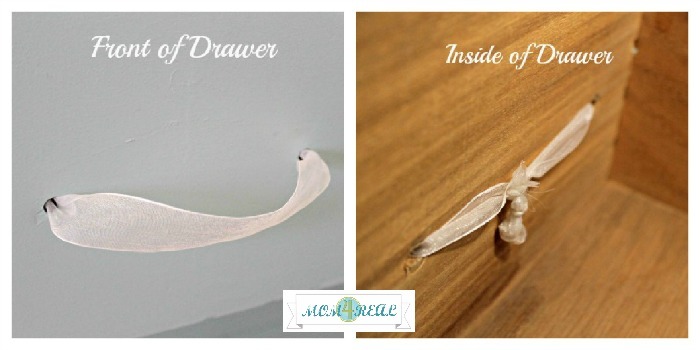 I have had the idea before for ribbon drawer pulls, but haven’t had the chance to use them myownself just yet – so glad you did! And I had to laugh about it ‘being your daughter’s room and not just for the blog’ – I’ve gotten that comment on more than one occassion – lol! Visiting from SSS and would love for you swing on by when you have a minute! What a huge difference!!! I love how pretty and shabby chic it looks now! And ribbon pulls…what a fun idea!!! So pretty, Jessica! I love the color and the ribbon handles are so sweet! Great job! What a gorgeous color, Jessica. The ribbon handles are PERFECTION! It’s beautiful! I love the color! Shared on FB! PLEASE, share the make and name of paint color you used for this BEAUTIFUL room! I am in the midst of creating a nursery in my home for my grand daughter and this is the perfect color for the walls and doors. I’m so excited I found your site. Hi, Kimberly! It is Lake Cottage by Valspar (primer and paint in one) I am using it to paint my foyer floors right now, and love it! It’s by far the best paint I have ever used! Thank you so much for stopping by!!! Congratulations on the grandbaby!! !